A second workshop on the study of Lake Vostok occurred in May 1995 at the Scott Polar Research Institute (SPRI), University of Cambridge, England, upon the recommendation of SCAR. A grant from the Royal Society in London provided me with support whilst at the SPRI in order to prepare for the meeting some 6 months in advance. Dr. Robin, former director of the SPRI, provided access to archives of all the radio-echo sounding flights that he conducted in East Antarctica. A reel from the archives was examined that had more than 100 negatives taken from an oscilloscope screen that showed a return radio-echo with coordinates of signal intensity versus time when the signal returned - so-called "A-scope" pictures. This reel was of special importance because the pictures were taken on 1 January 1974 on flight Number 130, the only flight along the entire length of Lake Vostok (Figure 8.1). According to Dr. Robin the main equipment for continuous monitoring of the ice sheet bottom did not work properly during this flight, as it was jammed for most of the time the plane flew over the lake. Only a small part of the flight shown in this picture was marked with thick, solid lines representing the ice-water interface marked "lake" at the left-hand side of Figure 4.2, and dashed lines representing ice/dry bedrock interface at the right side of Figure 4.2. However, equipment that produced "A-scope" pictures worked properly for the entire time the plane flew over the lake. Black dots in Figure 8.1 correspond to places where the "A-scope" pictures show the ice-water interface of the kind marked "lake" at the left-hand side of Figure 4.2 (see Figure 8.2). Figure 8.1. Lake Yostok seen as the relatively flat area of ice surface elevation contours. 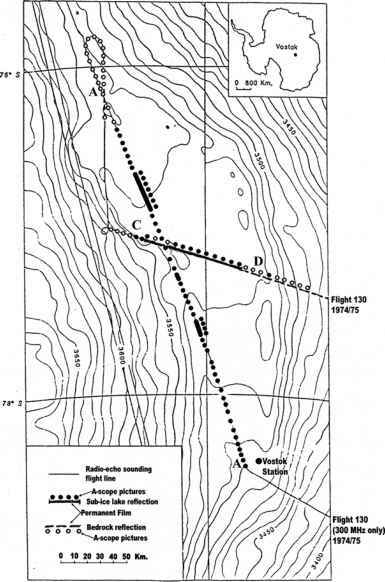 The thin, long straight line represents the route of radio-echo sounding for flight number 130 (1 January 1974), the only radio-echo sounding flight along the long axis of Lake Yostok. Thick, solid parts of this line show where the ice-water interface was recorded on a film of permanent bottom reflections of the type seen in Figure 4.2. Dashed parts of the line show where the film indicates the ice-bedrock interface. Dark dots correspond to separate "A-scope" pictures showing the ice-water interface. Open circles correspond to separate "A-scope" pictures showing the ice-bedrock interface. Figure 8.2. An "A-scope" picture. A radio-echo sounding picture from an oscilloscope screen, taken above Lake Vostok, showing a return radio-echo signal from the ice-water interface with coordinates of intensity of signal versus time when this signal returned (Dr. Robin, private commun.). 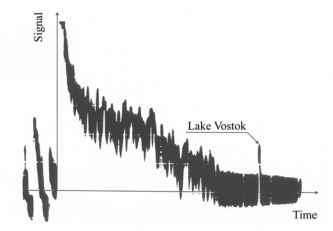 It should be mentioned that the sharp, slim signal marked as the "Vostok Lake", travels to the surface from Lake Vostok in about 47 ^s. Figure 8.3. A further "A-scope" picture. 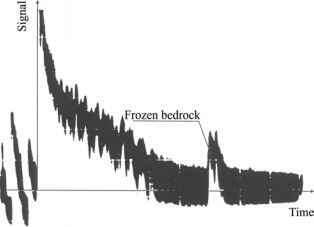 This picture shows a return radio-echo signal from the ice-bedrock interface. Note the weak, wide signal, which comes to the surface from areas where the ice sheet is on "dry" bedrock (Dr. Robin, private commun.). Travel times to the surface are approximately 30 ^s. interface, thus providing further evidence for the presence of Lake Vostok beneath the ice (black dots in Figure 8.1). The left-hand side of the "A-scope" picture in Figure 8.3 is similar to what is seen in Figure 8.2, but the right-hand side is different. There is a sudden increase of intensity of reflections as in Figure 8.2, but the increase is not as high nor as sharp as the reflection from an ice-water interface. Dr. Robin interpreted the latter as a signal from the boundary of the ice sheet and the underlying bedrock. Locations with this type of bottom reflection along the track of flight number 130 are marked by open circles in Figure 8.1. Note also that Figure 8.1 shows that a large part of flight number 130 is marked with black dots, indicating that the plane flew along the long axis of Lake Vostok as well as across it. In only one place, the middle of the lake, did the reflection of the ice-water interface change its appearance, becoming shorter and thicker, suggesting that the plane crossed an island or a peninsula (further study confirmed this was the case). In later years (Popkov et al., 1998; Masolov et al., 2001), the combined study of seismic and radio-echo sounding along line 2-2' (Figure 9.1) east of Vostok Station showed that the "A-scope" reflections for ice-water and ice-bedrock interfaces confirmed Dr. Robin's interpretations of Figures 8.2 and 8.3 (see Figure 8.4). The common feature of all "A-scope" pictures is the monotonous change of the distance between the upper and the lower signals, which corresponds to the thickness of the ice above the lake (a line of black square dots in Figure 8.5). This ice thickness increased from 3,700 m at the southern edge of the lake near Vostok Station, where the plane approached the lake, to about 4,200 m near the northern shore, where the plane left it as seen in Figure 8.5, representing a difference of about 500 m.
It can be seen from the map of surface contours of the ice sheet above the lake in the lower part of Figure 8.5, that the surface elevation of the ice sheet near Vostok Station is 3,500 m and increases slightly to the southern edge of the lake, a difference of less than 50 m. It is clear that the floating ice cover moves, spreading from north to south, because only by such movement and spreading of the ice can it support nearly 500 m difference of floating ice cover thickness at the northern and southern parts of the lake. The similarity between floating ice cover exhibiting features mentioned above and ice shelves in glaciology is apparent. Hence it is reasonable to give the name "Lake Vostok Ice Sheet'' to the part of the ice sheet above the lake. Figure 8.4. Example of radio-echo sounding through the ice sheet above Lake Vostok (line 22' east of Vostok Station as shown in Figures 9.1) and selected radio-echo sounding traces ("A-scope"-type pictures) for ice-water and ice-bedrock boundaries confirming Dr. Robin's interpretations of Figures 8.2 and 8.3 (adapted from Masolov et al, 1999). Figure 8.5. Subglacial Lake Yostok in surface elevation contours of 2-m intervals (lower part of the picture). A graph showing the change of Lake Vostok ice cover thickness along the length of the Lake, obtained from "A-scope" picture studies is shown in the upper part of the picture (adapted from Zotikov, 1998). (1) Black square dots represent positions of "A-scope" ice-water interfaces along the Lake; (2) open square dots represent positions of "A-scope" ice-bedrock interface (heights of the squares indicates the uncertainty of the interface positions from the "A-scope" picture studies due to the width of interface reflections); (3) island or peninsula in the middle of the lake; (4) surface elevations (meters above sea level); and (5) - line of flight number 130 (the graph is plotted along this line). Figure 8.6. 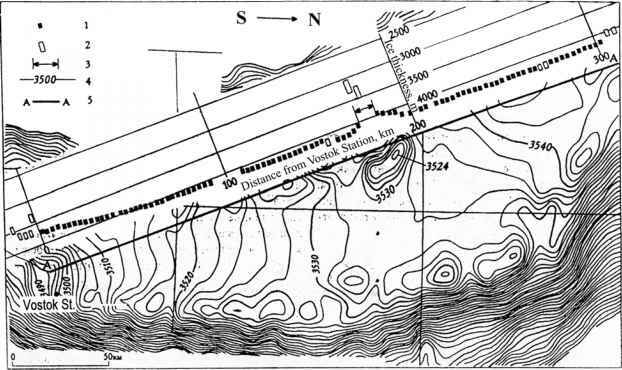 Lake Yostok Ice Shelf in surface elevation contours of 2m. (1) Vectors of ice cover movement; (2) Lake Yostok Ice Shelf shores; (3) surface elevations (meters above sea level). Note the "along lake" component of movement of this ice shelf. This component increases from north to south. the perimeter of the coasts of Antarctica. First, it is much larger than modern ice shelves, although there is evidence that large ice shelves existed in the past. Second, this ice shelf does not have an open side that marks an open water level. This ice shelf should thus be called an "internal" ice shelf and an "open" water level should be determined by calculation. If the ice cover above the lake is an ice shelf, then the component of movement of this ice as an ice shelf is directed from north to south and should increase in this direction (Figure 8.6). The differences of ice thicknesses and surface elevations in different parts of the lake's ice cover were studied to estimate the water density and salinity of Lake Yostok without actual penetration into the lake. Investigations by the author have shown that for an ice shelf, where each part of its body is in hydrostatic equilibrium with the water below it, there is a simple theoretical relation between the change of the surface elevation H and the thickness h of the ice shelf and the ratio of the mean density of ice shelf ("pice") and density of the water, in which the ice shelf floats ("pwater"). This relationship can be represented by plotting H on the vertical axis for different locations on the ice shelf against h on the horizontal axis -theoretically this should plot a straight line. In this case the slope of the line represents a ratio of the mean ice shelf density to water density (Kapitsa et al., 1996). Figure 8.7. Thickness h of floating ice from "A-scope" pictures plotted against surface elevation H at locations clear of the boundary effects along and across the lake for flight number 130. Also shown are theoretical slopes for ice in the same thickness range given by the equation in the figure, where pice and pwater are densities of the ice and the water of the lake, respectively. 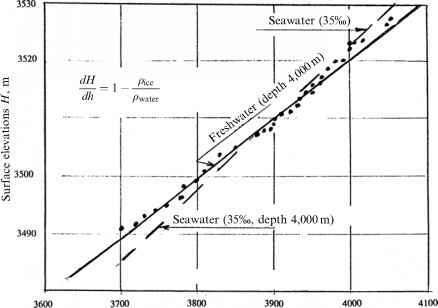 One of these lines represents water of 35%o salinity (pure seawater), the other for freshwater (adapted from Kapitsa et al., 1996). It can be seen in Figure 8.7 that plotting experimental points determined from surface contours against "A-scope"-based ice thickness data taken on flight number 130 approximates a straight line, with the slope of the line close to that for freshwater or water of low salinity. The same process was used to determine an "open" water level, or the level that the water would reach up a borehole drilled through the ice and into the lake itself. The level calculated was 3,100 m above sea level, an important result because it means the water of Lake Vostok has no contact with the ocean. These data were among those presented by Dr. Robin and me at the "Lake Vostok Workshop" at the SPRI on 22-24 May 1995. Dr. Heap, Director of the SPRI welcomed the participants and explained the background of the meeting (the workshop was initiated as a result of his letter of 30 March 1995). Environmental Impact Assessment (EIA) under the Protocol would likely require a Comprehensive Environmental Evaluation (CEE). The successful outcome of the EIA procedure would depend on the strength of the scientific case for drilling through the ice to the lake and the underlying sediments. Drs. Robin and Zotikov considered that the workshop should focus on defining the "relevant scientific investigations" which, by improving the description of glacial and subglacial environments of the lake, would significantly reduce uncertainties about the probable nature of the lake water and underlying sediments. Dr. Heap suggested that the aims of the workshop should be to provide advice on how best to meet the provisions of paragraph 1 of the SCAR recommendation, to consider the scientific case for drilling through the ice into the lake, to discuss briefly possible non-polluting drilling technologies, and to outline scientific investigations that would assist in reducing uncertainties about the lake and its environs." The report on the workshop, written after the meeting by Drs. Dowdeswell and Vaughan (glaciology) and Drs. Wynn-Williams and Ellis-Evans (lake water and sediments), included the current state of knowledge at that time (i.e., the first evidence of the presence of Antarctic subglacial lakes that was inferred from observations of extensive areas of very flat ice surfaces around Vostok Station). Evidence from airborne radio-echo sounding later showed areas of unusual continuous reflections from the bottom of some areas of the ice sheet in regions of thick ice, especially around ice divides. A list of interested specialists was developed as a means of involving people with relevant backgrounds and experience: Barkov, N. I., Russia, ice core studies; Bentley, C. R., U.S.A., seismic sounding; Dowdeswell, J. A., U.K., glacial geomor-phology; Kamb, B., U.S.A., ice dynamics; Kotlyakov, V. M., Russian National Committee, glaciology; Lorius, C., France, French National Committee, ice core studies; Petit, J. R., France, ice core studies; Rees, W. G., U.K., radio-echo sounding; Rutford, R. H., U.S. National Committee, glacial geology; Tabacco, I. E., Italy, radio-echo sounding; Walton, D. W. H., U.K., SCAR, SCAR Group of Specialists on Environmental Affairs and Conservation; Watanabe, O., Japan, glaciology; and Wynn-Williams, D. D., U.K., microbiology. Many others expressed an interest in participating, so the original list of participants grew considerably. The sole participant from the U.S.A. was the president of SCAR. (1) Seismic reflection sounding. Only two vertical seismograms survive from the fieldwork of the 1960s. Both will be interpreted to indicate a strong ice-water reflector at 3,700 m with a 500 m deep water column beneath. This is in turn underlain by what is interpreted as a 180-200 m thick accumulation of sediments, and then bedrock. Figure 8.8. 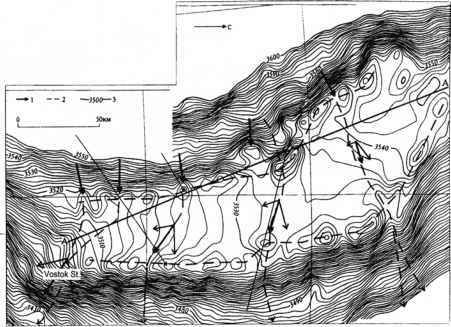 First cross section of Lake Vostok presented by Dr. Zotikov for the second (1995) workshop on subglacial lake exploration. The bottom of the ice cover of the lake is plotted using ice thickness data from "A-scope" picture studies; the lake's bottom position is plotted using only one data point (Kapitsa's seismic measurements at Vostok Station), the rest of the bottom is plotted hypothetically and later measurements have shown that the position of the bottom in this picture is wrong. Bent arrows are plotted to show the direction of flow of the main currents in the lake (these may need adjustment after future analysis). Figure 8.9. Cross section of a middle part of Lake Vostok along a line of the second part of flight number 130 (line C-D in Figure 8.1). (1) Bottom of Lake Vostok ice cover from a continuous record of bottom radio-echo reflections; (2) internal layers from a continuous record of internal radio-echo reflections; (3) bottom of Lake Vostok ice cover based on "A-scope" picture analysis (black square dots are the positions of an "A-scope" ice-water interface along the lake, open squares represent positions of "A-scope" ice-bedrock (no water) interfaces - the height of the squares indicates the uncertainty of the interface positions due to the width of interface reflections); (4) two strongest internal layers from a continuous record of internal radio-echo reflections; and (5) surface elevation. Note that "A-scope" pictures show that there is no water below the ice at the top of the "island"-type feature at the left and right sides of the curve of the ice bottom boundary. Distance along lines C-D is in kilometers from the top of left (west) "island". Arrows show the direction of ice flow. basin to a very high accuracy. Accuracy of the ice topography is now ±1 m, with a precision of ±0.2m, and is available every 350 m along a satellite track. Individual heights represent an average over a nominal 3 km footprint. These data have been used in the definition of lake extent and in calculations of lake water density. Depressions on the order of 5 m appear to define the inland margin of the lake, while a semi-continuous rise up to 12 m is associated with the downslope margin (Figure 8.6). (4) Geophysical studies in the Vostok borehole. Since 1980 three cores have been drilled close to Vostok Station. Present ice flow models suggest that the ice at 2,000 m depth in the most recent core fell as snow 200 km upstream. The core represents more than 250,000 years of proxy climatic records. The Holocene, the last glacial with its stadial and interstadial episodes, a warm and relatively stable Eemian interglacial, and at least one further glacial-interglacial cycle is evident in the oxygen isotope, electrical conductivity, and other chemical signals. Methane and CO2 gas concentrations also vary over glacial-interglacial intervals. Borehole closure studies yielded a value of 3.2 for the power flow constant of ice. The current borehole temperature profile is important for calculating the temperature at the ice-lake interface. Microbial analysis of the Vostok ice core has also been undertaken. It was mentioned that more than 370,000 km of airborne radio-echo sounding profiles have been analyzed in order to look for information on subglacial lakes. More than 70 other subglacial lakes below the Antarctic Ice Sheet were found up to 50 km in length. Most of these lakes are located near ice sheet divides in the thickest parts of the East Antarctic Ice Sheet. It was reported that locations of these lakes are being compared with the ERS-1 radar altimetry data, and lakes with surface expressions larger than 10 km will be included on the map of Antarctica. 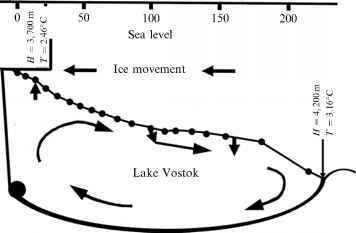 A summary of glaciological information of Lake Vostok was established at the workshop, as follows: location, 78.3°S-78.5°S, 102°E-106°E; area, 10,000 km2; length, 230 km; maximum width, 50 km; ice thickness, 3,700-4,200m; depth of water, 500 m (from single data point, Vostok Station); possible thickness of sublake sediments, 100-200 m (from single data point, Vostok Station); ice velocity, 3myr_1 (from single data point, Vostok Station); and surface accumulation rate, 2.3 gcm~2. Workshop participants also discussed other projects of deep drilling in central Antarctica. Deep drilling at Dome C is planned by The European Project for Ice Coring in Antarctica (EPICA). Deep drilling at Dome Fuji (Dome F) by the Japanese Antarctic Expedition was also discussed at the workshop. Figure 8.10. 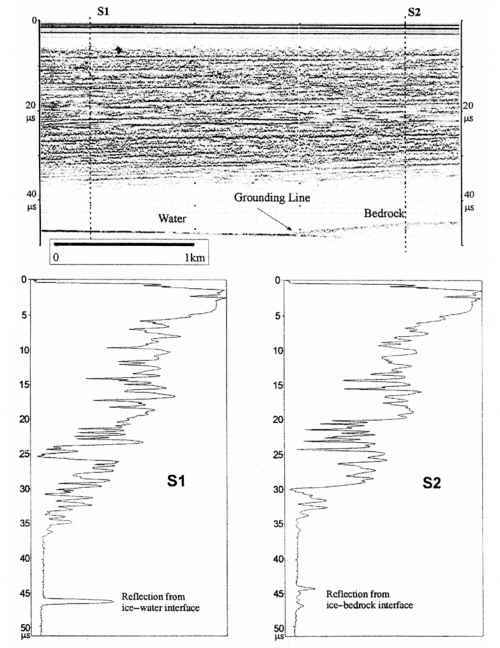 Combined radio-echo sounding and seismic measurements along the long axes of Lake Vostok (3-3' in Figure 9.1) and two transverse profiles across the lake (1-1' and 2-2' in Figure 9.1) performed in 1995/1996 austral summer by the RAE. The expedition revealed the actual position of the lake bottom and the existence and size of the bottom sediment layer (adapted from Masolov et al., 1999). Stream) and/or global positioning system (GPS) methods with the aim of obtaining an ice velocity field and flow regime. 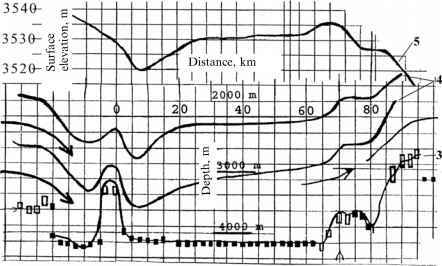 Results of this discussion initiated an immediate reaction and combined radioecho sounding and seismic measurements were made along the long axes of Lake Vostok and two transverse profiles across the lake in the 1995/1996 austral summer by the Russian Antarctic Expedition (RAE) (Figure 8.10). They revealed a more accurate position of the Lake bottom and existence and dimensions of the bottom sediments (Masolov et al., 1999). An interesting discussion occurred about the lake water and bottom sediments. It was postulated that a radio-echo radar can penetrate freshwater through depths of 15-25 m and in any circumstances up to 50 m. It was agreed that Lake Vostok is a relatively freshwater lake. The meeting also accepted the possibility of some form of circulation of lake water because of a gradient of about 500 m elevation in the ice roof of the lake from its northern to southern end, giving a thermal gradient of 0.50°C due to the pressure dependence of the water's freezing temperature, which changes from —3.15°C at the ice-water boundary at the northern end to —2.45°C at the southern end. Water convection due to this temperature difference may be "as little as 1-2myr—\ but this is enough to have a dramatic effect on the ice-water system in terms of heat flow''. Following this approach a few years later, scientists developed a computer model of the water circulation processes in Lake Vostok below the Lake Vostok Ice Shelf, which showed a circulation of the kind in Figure 8.8 for slightly salty water and a circulation of opposite direction for pure water (Figure 8.11). The concluding words of the Lake Vostok workshop in Cambridge, 22-24 May 1995, were also words of warning, stating that local heat transfer conditions at the ice-water interface could be different in areas of the lake, and an area of localized bottom freezing found below Vostok Station is a product of that origin. The workshop also initiated a new, more serious approach to the biological study of the lake. It was first considered that the only life that would be found in the lake or in its sediments would be microbial (bacteria). There would not be enough nutrient material in the lake to support any living bacteria and that no known bacteria would be able to exist for a long period in water in a state of suspended animation. There would be no equivalent of a Loch Ness Monster here. However, it was recognized that there could well be bacterial flora contained in the lowest ice layers that could be reactivated when lake water enters the base of the borehole and migrates into the ice wall. It was also suggested that the moving ice could carry nutrient carbon into the lake from coal and hydrocarbon deposits upstream and from sources of volcanic activity, but such carbon would not be in a form suitable for bacterial nutrition. Figure 8.11. 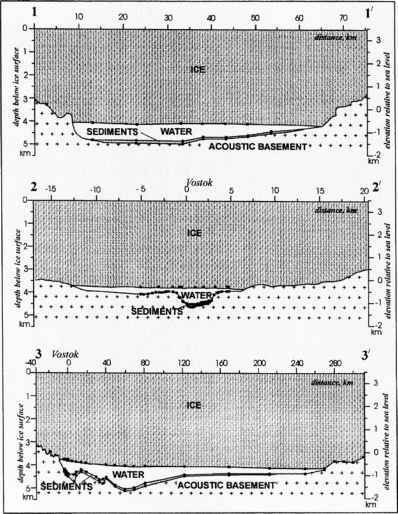 Water circulation within Lake Vostok below the Lake Yostok Ice Shelf and above and still uncorrected lake bottom topography. Left-hand side: circulation calculated by numerical modeling, assuming the water is pure (after Williams, 2001; Wuest and Carmack, 2000). The white arrows show the bottom water circulation and the black arrows denote a higher level circulation close to the base of the ice. Dots refer to upwelling of lake water, crosses denote downwelling. There are two clockwise circulation paths in the upper and lower areas of the lake. Most of the vertical mixing takes place in the southern two-thirds of the cavity, but this exchange is rather limited. Right-hand side: the lake is saline to a small extent (Souchez et al., 2000) (adapted from Siegert et al., 2003). medical and economic importance. Ice and sediment microbes are sensitive indicators of climate change, such as that reported by Abizov (2001) representing an 8°C change at approximately 200,000 years. It is important to mention that these microbes represent the micro-biota existing before major global pollution processes started. "Micro-organisms found to date in the youngest layers of ice at Vostok by Dr. Abizov include non-spore forming bacteria of well known genera (Abizov, 1993), but only about 1% of the total micro-biota can be grown under currently known culture conditions. There is therefore much more genetic potential if PCR techniques are used. Yeasts have been isolated from ice formed 3,000 years ago and filamentous fungi formed 36,600 years ago. Actinomycetes, branched bacteria, renowned for antibiotic production, survive for 2,200 years and include a new species. A unicellular alga has been isolated from 119,000 year old ice, whilst dormant spore-forming material can survive for at least 200,000 years (at 2,395 m). Their value for science includes fundamental studies of their membrane structure and function, their ultra structural adaptations and their survival potential. This concerns their tolerance of low temperatures, high pressures, high local osmotic stresses, nutrient starvation and high oxygen concentrations (hyperoxia) due to exclusion of gases from re-freezing water'' (From Drs. Wynn-Williams and Ellis-Evans, during the Lake Vostok workshop). In the absence of free water (at about —55°C in the upper part of the ice sheet) microbial survival is extremely long due to the protection of critical molecules such as proteins from osmotic stress by compatible solutes (antifreezes). Bacterial viability in the pure ice of the Vostok area is not as great as in the Siberian permafrost (up to 3 million years) because of the protective function of mineral particles that concentrate nutrients and permit mutual support within biofilms (Gilichinsky et al., 1995). Morainic inclusions in Vostok ice may fulfill this function. In Antarctic habitats, such as endolithic communities within rocks, viability times can be up to 23,000 years, so that growth rates in low-temperature ice may be very slow. Long-term radiation damage to microbial DNA has been reported in permafrost environments and requires basal metabolism for its repair. Spores of bacteria and other microbes, including yeasts and filamentous fungi, have been shown to remain viable for between 25 and 135 million years in the intestines of bees preserved in amber (Cano and Borucki, 1995), although their carbon may have been recycled in this closed-circuit habitat. This indicates a potential for the viability of quite old microbes in the remaining ice profile above Lake Vostok down to 3,600-4,200 m. The transition zone above the lake, where the pressure melts ice and ice crystals with free water is an area of great microbiological interest. Organisms in this zone of potential accumulation of nutrients and active metabolism at low temperature will inoculate the oligotrophic (low nutrient) lake water and initiate a microbial sedimentation process. Study of this microbiota requires strict aseptic procedures, including controls such as the use of minute bacteria such as Serratia Marcescents to test for the penetration of the ice fractures and contamination of equipment by drill fluid (Abizov, 1993, 2001). The lake has been isolated from the atmosphere for tens or hundreds of thousands of years and is therefore unique. It is not known if the lake is derived from the pre-glacial lake or a system formed by glacial processes. A pre-glacial lake may have left some evidence (even cultivated material) within the lowest sedimentary strata. This would likely be a more diverse fossil flora and fauna than the modern lake contains. It is likely that viable organisms would not survive from a "fossil lake", but nucleic acids might be present that would respond to the PCR technique. The water column itself is unlikely to contain significant numbers of microbes because of its extremely nutrient-poor status and limited mixing. The presence of free water will enforce microbial growth and immediately stress those organisms released from the ice. The lake presents a number of significant stresses. First, the low temperature (around —2°C) will be unacceptable for methophiles. The pressure imposed by 4 km of ice will equate to that which is found in the average ocean depth and many micro-organisms deposited and frozen into the ice cover will not be tolerant of such pressures. The nutrient status of the water column will impose an immediate severe stress on most cells and there is a potential for a marked osmotic change on being released from the ice. Dragging of water by the ice sheet towards the downstream lake edge will result in ice formation at that point, and thus exclusion of dissolved gases, notably oxygen and nitrogen. Similar gases trapped and compressed in the ice sheet will have been constantly released on melting of the under-ice sheet and contribute to a potentially hypoxic state. High oxygen concentrations are lethal to many organisms but are found in several perennially ice-covered Antarctic lakes. Those organisms which can survive the physiological shock of release from the ice transition zone will probably exist either as dormant spores or as stressed micro-cells. The main area of potential microbiological interest is the sediment that may be as much as 200 m thick and is probably continually replenished by sedimentation from the ice and, quantitatively more significantly, by lateral deposition of morainic debris. The morainic material will be inorganic with negligible organic content. The presence of mineral particles to act as potential substrata for microbial biofilms is significant. The continual inoculation of the sediment by deposition from the ice increases the statistical probability of viable forms and it seems highly probable that despite the stresses, viable micro-organisms will occur. 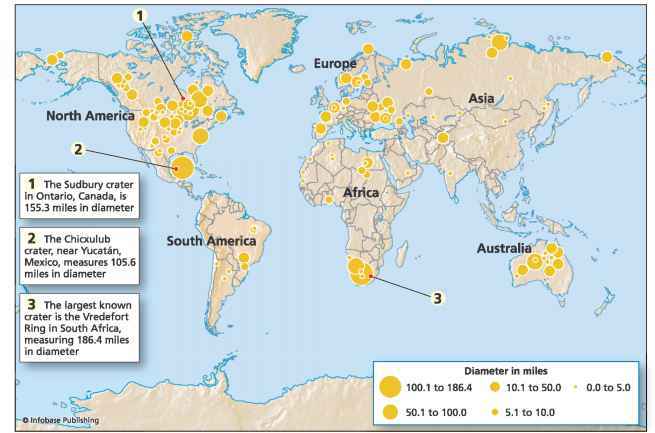 Hot spots of geothermal activity might permit significant local community development in a habitat isolated from current climatic changes and man-made environmental impacts. The potential population would have a valuable gene pool and for the ice core microbiota, with all the associated benefits for science, medicine, and commerce. The use of PCR techniques on the DNA of the organisms would yield valuable information on the history and biochemical potential of an ancient microbiota. There may also be implications for exobiological studies which also concern life at extremes. Carbon supplies will be very limited and, in circumstances of low energy status, much of the carbon may be unavailable as it takes too much energy to break down and utilize. Knowledge of the community structure would help to resolve the origin of the lake either as a "fossil lake'' or as a primordial sub-ice water body. It may also address the issue of the possible catastrophic deglaciation of the Pleistocene Ice Sheet. The sediment microbiota will reflect the dynamic nature of the lake in terms of morainic deposition, biotic and mineral sedimentation, temperature gradients, convection, refreezing, and geothermal activity. If the lake can be penetrated with a minimal contamination (some environmental impact is inevitable but can be minimized by careful planning), much valuable microbiological information could be derived from sediment cores if not from the water column. Workshop participants reviewed the evidence for the existence of a large body of water beneath the inland ice in the area of Vostok Station and extending beneath it. They agreed the following recommendations. (1) Presently ongoing core drilling at Vostok Station should proceed, but not penetrate into the water beneath the ice. Termination of drilling can be determined while drilling from measurements of ice temperature and remaining ice thickness. Based upon our present state of knowledge the minimum remaining ice thickness should not be less than 25 meters. (2) Additional geophysical surveys should be performed to better define the glacio-logical and geological setting of the lake. The highest priority is to be given to seismic measurements in order to confirm the existence of a large body of water and underlying sediments. (3) Provided the existence of a large water body can be confirmed, studies must be made to find techniques for accessing and sampling the water and sediments beneath with minimum contamination of this environment. Consideration should be given to testing such techniques at alternate sites, where monitoring would be possible. These recommendations are published here to stress that participants of this workshop, aware of all the information about the lake's discovery, avoided admitting that the Lake exists, but instead left it to a scientific community to determine the existence of the lake. We know now that the existence is widely and enthusiastically endorsed.